Fabian Núñez first visited Kevin de León&apos;s house sometime in the mid-&apos;70s, when the two were friends in junior high. Núñez grew up in the Logan Heights neighborhood of San Diego, in a home that fit 10 people into two rooms. Poverty had never shocked him—until he visited de León&apos;s house, "I had never met anyone more broke than I was," Núñez explains. De León greeted Núñez outside his address and led him around the corner of the building, to what looked like the entrance to a basement crawlspace. Inside, pipes ran bare overhead in the dimly lit room. A twin bed was pressed up against one wall and a cot against the other; between the small bed and the cot sat a white bucket, full of stagnant water. When Núñez asked de León what the bucket was for, de León explained that, when someone showered in the house above, the pipes had a tendency to leak. De León never mentions the bucket. Nor does he talk about piping, or any of those other physical details of poverty. Instead, de León, one of the two California candidates vying for a seat in the United States Senate, settles on the same talking points: How his mother, who raised him by herself, immigrated from Guatemala with a third-grade education, in search of a better life; how she cleaned houses to support him; how she taught him the value of hard work. 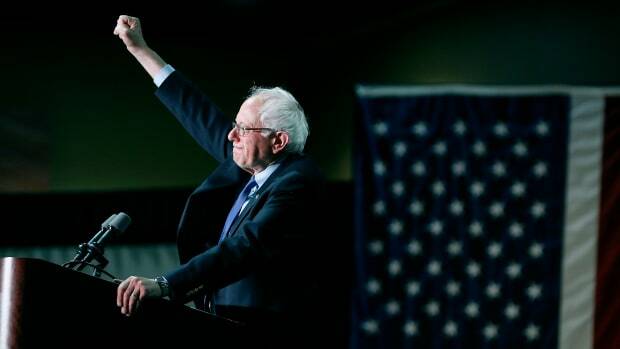 It&apos;s a narrative he turns back to again and again: He tells his mother&apos;s story in a church full of graduating college students in Palo Alto; and again in an auditorium in Los Angeles; and again in a speech delivered at the 2016 Democratic National Convention. Each time, he builds the arc to a familiar crescendo: "My story is not my own, but the story of millions of Americans," he&apos;ll say. "My story is not unique," he tells me. "Mi historia no es única," he tells a crowd in Vista, California. 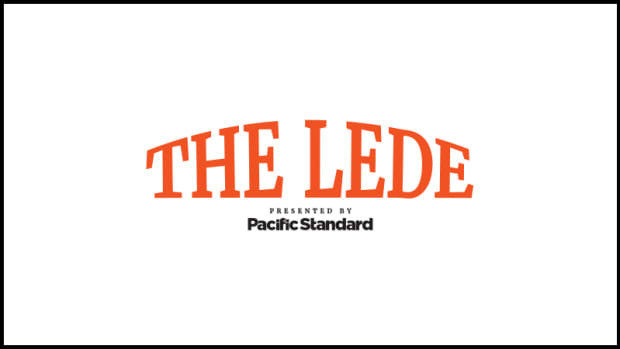 Four years ago, when de León became the president pro tempore of the California state senate (the first Latino to hold the position since 1883), reporters wrote that the state senator from Los Angeles lacked a natural skill for oration. That, it seems, has changed. After announcing his bid for U.S. Senate a year ago, de León has figured out how to tell his story like a politician. From of a complicated personal history, he&apos;s pulled out the universal details (the "story of millions of Americans"). He offers the story of his mother&apos;s sacrifice ("she had the strength, the courage of her convictions, to come here searching for a better life"). He gives us the American Dream, the most classic of campaign tropes. The strategy is not working. 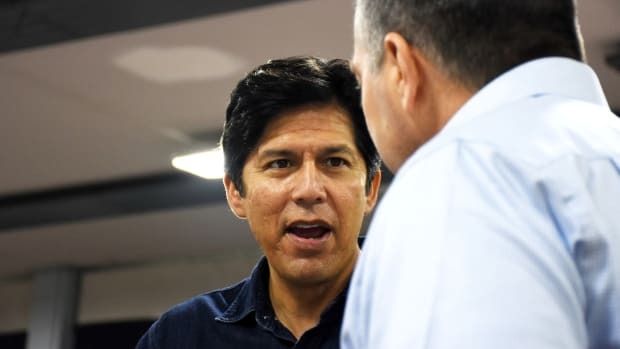 His campaign has doubled down on the bet that identity will win this race, but de León—despite having the endorsement of the California Democratic Party—is still set to lose. He is one of the most accomplished candidates running anywhere in the country, yet he is still likely to lose to a 26-year Democratic incumbent, Senator Dianne Feinstein: Current polling has her up nine points. In a year that&apos;s supposedly characterized by an anti-establishment movement among Democratic voters, de León&apos;s losing campaign against an 85-year-old senator reveals how firmly the old guard&apos;s talons are still dug into the party. 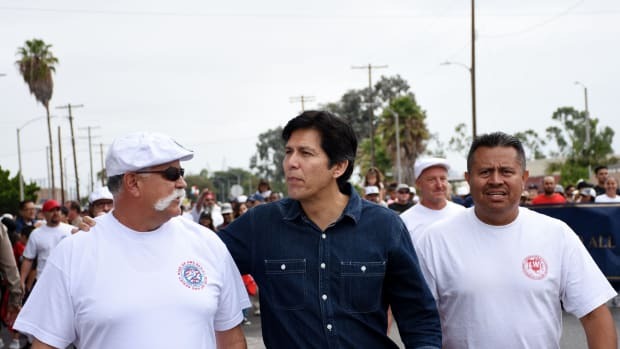 In June, after de León rose out of California&apos;s run-off primary to face his fellow Democrat in the general election, newspapers and magazines highlighted his story, marveling at his chances to take down a Democratic titan. In the same year as Alexandria Ocasio-Cortez&apos;s primary upset in the Bronx and Ayanna Pressley&apos;s victory in Massachusetts, de León fits the archetype of the insurgent (young, Latino, with a platform rooted in expanding opportunity). But, in the end, it seems Feinstein has got him beat. Leading Democrats in California, many of them national figures, like San Francisco Congresswoman and House Minority Leader Nancy Pelosi, have fallen in line behind the incumbent; most reporters consider the race over. It&apos;s less than two weeks before the election, and de León and I are both passengers as his press secretary drives us south for a campaign event near San Diego, plodding along through typically congested Southern California traffic. Sitting in the seat behind him, I scan the back of de León&apos;s head: He has the sort of thick, dark-colored hair that has followed Kennedy men to political success for decades. He&apos;s tall (enough that his seat is pushed back toward my knees, though he&apos;s nice enough to ask me repeatedly whether I need more room) and handsome, with high cheekbones and a strong jawline. He looks like he&apos;s in his early forties (he&apos;s 51). Tonight, he&apos;s wearing an open-collared white shirt tucked into blue jeans and boots. The beat-up old Mazda is full of campaign materials: There&apos;s a pile of "Kevin de León for U.S. Senate" yards signs and small placards listing his platform—Medicare-for-All; clean energy; immigration reform; $15 minimum wage. There&apos;s a scrap of paper with a bullet-point list of the major legislative achievements de León authored in the state senate—Senate Bill 100, a bill committing California to 100 percent renewable energy by 2045; SB 54, a bill turning California into a "sanctuary state" for undocumented immigrants; SB 967, a bill mandating universities and schools in California adopt affirmative consent, "yes means yes," policy. There&apos;s a crumpled road map of California. It makes sense the materials are pushed into the back of a Mazda with peeling paint. In the last four years, as a state senator, de León accomplished as much as any Democrat in the country. But come on: Do you know your state senator&apos;s name? The Mazda&apos;s engine makes a crunching sound and groans, like it&apos;d rather stop. But the Mazda, like de León, keeps pushing forward. That&apos;s a sentiment I often hear about him: People who knew him as a kid say he always seemed destined for ... well, something. Nuñez tells me stories of a natural leader: he tells me how, as a competitive cross country runner, de León would help his team by studying the best shoes to wear and the proper way to stretch; how he was constantly reading, learning about current events and American history; how, when Cambodian and Vietnamese immigrants began moving into the neighborhood, de León started to study up on Southeast Asian culture, to try to better relate to the new kids at school. Once, a 15-year-old de León stood in front of the high school&apos;s student government and demanded they take a stand on the U.S. proxy wars in Central America, and President Ronald Reagan&apos;s support of the far-right Contras in Nicaragua. When the other students seemed more interesting in planning dances, de León did not back down. "People are suffering, because of us," he said. "We need to do something." De León is quick to refute these accounts; he&apos;s running a campaign to represent regular Californians, and he tells the story of himself as a regular Californian: someone who was just struggling to get by. When I tell him his old friends&apos; stories of his early leadership, he shakes his head and exhales. In the car, he swivels his head back to face me. "If you had met me back then," de León says of his Logan Heights days. "You would not have been impressed. You would have thought, &apos;Nice kid," but not much more than that." 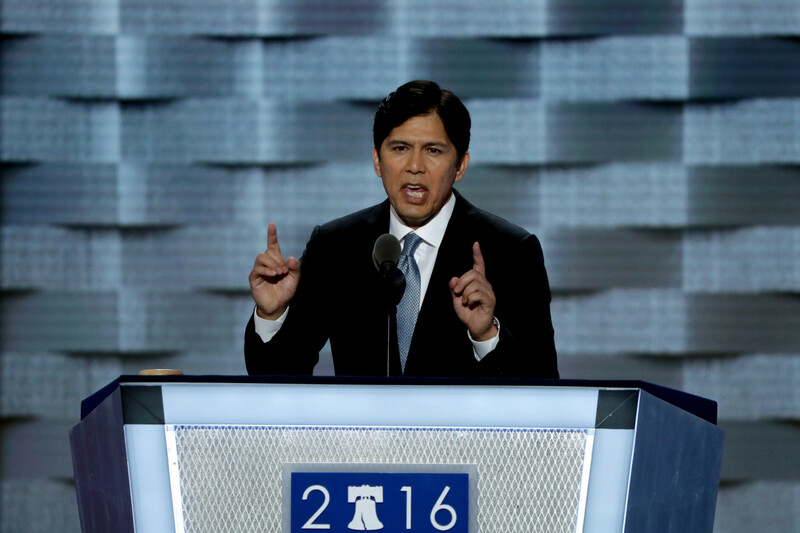 Kevin de León delivers a speech on the first day of the Democratic National Convention on July 25th, 2016, in Philadelphia, Pennsylvania. "If you would have met me in elementary school or in middle school, I think you would have walked away thinking there was nothing spectacular about me," he told a columnist for the Sacramento Bee back in 2015. "If you had met me you would have said: &apos;Oh, nice kid. Nice guy.&apos; But that&apos;s it." De León says he did compete in multiple sports, even raced in the city championships. But did he research running techniques for his cross-country teammates? No. Was he always reading? Not really. Nor was he a particularly good student. In fact, after becoming the first in his family to graduate high school, he failed out the University of California–Santa Barbara before he&apos;d completed his freshman year. I ask him about standing up in the student council meeting: a 15-year-old opposing the proxy wars in Central America. "That one," he pauses for a beat, "is true." I offer that maybe what he did that day was different from politics: It was activism. "Yes, that&apos;s it," he agrees. "I was never interested in electoral politics." He continues: "I&apos;ve never worked for a politician before. I&apos;ve never been a congressional fellow or a Senate fellow, or an intern. I never aspired to political office. I was never a young college Democrat. So, I was never infected with the political bug." This is also a line I&apos;ve heard before. (To be fair, a lot of reporters ask de León the same questions I&apos;m asking.) Earlier this year, he told a Washington Post podcaster: "I never thought about getting into electoral politics; I never worked for a politician; I was never infected with the political bug." This account, remember, is a campaign trope. No one likes the natural-born politician: the kid who campaigned fiercely to be sophomore class president; the college Young Democrat or Young Republican who wore a nice watch and shook your hand too hard. No politician wants to admit the obvious fact that, at one point, they decided they wanted to be a politician. But, for de León, this seems more authentic than other politicians who claim they were thrust unwillingly into power. For the first 25 years of his life, de León spent more time grinding out a survival than planning an electoral career. In the mid-&apos;80s, de León spent two years sleeping on the floor of a bare-bones room in Santa Barbara. After dropping out of UCSB, he hit a not-quite-quarter-life-crisis. He couldn&apos;t go home—"Que haces aqui?" his mother would ask, heartbroken. Instead, he began working as an English language teacher, helping immigrants acquire proficiency on their way to normalizing their status. That floor he slept on? That was also his office. It was in these years that de León became a community organizer, almost by accident. It began when he started poaching ESL students studying at the local community college to come study under him instead. He would wait outside their lessons, putting his flyers under window wipers and greeting the students in the parking lot, chatting them up in Spanish. As his following grew, de León began helping with more than just English lessons, offering his services for each part of the citizenship process. His office began working like a community center. That one office became over a dozen after de León met Juan Jose Gutierrez, the director of One Stop Immigration, at a party in Los Angeles in the early &apos;90s. One Stop Immigration ran offices all across the city, helping immigrants through every step of their naturalization or citizenship process. After de León came on board, he was soon running the entire operation between Santa Barbara and L.A. Núñez, his old friend, took on the effort in the south, running offices in southern L.A. County. The moment that de León calls his "second political awakening" (the first being the wars in Central America) came when a sudden and drastic anti-immigrant fever infected California in the mid-&apos;90s. The end of the Cold War had abruptly cut off the firehose of cash to the aerospace and defense industry in Southern California, and people were suffering. 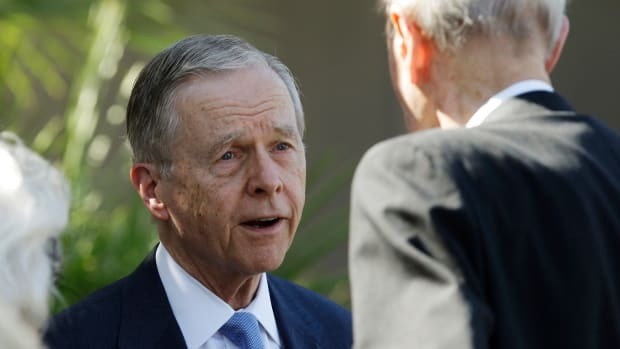 California politicians, led by Republican Governor Pete Wilson, shouldered the blame on immigrants. "To witness politicians blame the immigrants for the economic downturn was appalling," de León says. "It was cowardly that you couldn&apos;t have politicians explain in a very honest manner to folks, who were feeling real economic pain, why they were in this situation that they were in." The anti-immigrant wave culminated in 1994 with Proposition 187, a ballot measure that sought to create state-sponsored citizenship screening and cut off undocumented peoples&apos; access to nearly all public services. At a party where she hosted the Latinx leadership in the state, the Democratic candidate for governor, Kathleen Brown, told an audience—that included de León, Núñez, and Gutierrez—that she couldn&apos;t risk losing the election on the immigration issue; she wasn&apos;t going to stand up to Wilson and Proposition 187. California Democrats weren&apos;t going to die on that hill. Appalled, de León, Núñez, and Gutierrez met up after the party and began planning what would become some of the largest civil rights marches in Los Angeles&apos; history. Against the wishes of the state Democrats, the trio began organizing immigrant communities to mobilize against the election, staging massive protests in February and October of that year. In the October protest, over 70,000 people marched from the largely Latinx eastside neighborhoods into downtown. While the effort ultimately failed, and California voters approved Wilson and Prop 187 (a federal judge would later strike down the law as unconstitutional), the Latinx community in California had become more organized than it had been in decades, and de León and Núñez were suddenly leaders of a movement. Núñez would levy that momentum into a successful run for state assembly in 2002 (de León was his campaign manager), and de León himself would follow him into the assembly in 2006, winning an uphill race against Christine Chavez, Cesar Chavez&apos;s granddaughter. Feinstein, who became senator for the state in 1992 (after losing the governorship to Wilson two years earlier), held her tongue on Prop 187 for most of the election. Two weeks before voting, after President Bill Clinton came out against the ballot measure, she finally offered her tepid opposition to the proposition. De León hasn&apos;t forgotten this. "There was no moral clarity, there was no moral leadership," he says. "It was a political calculation." De León&apos;s commitment to the "moral bottom line" is a trait his campaign plays up—and it&apos;s not something his detractors deprive him of. Even among people who disagree with de León, or dislike the man, there&apos;s the consensus that de León&apos;s platform comes from his gut, and not a polling machine. For a candidate who has rooted his political career in moral issues like immigration and climate change, however, some say his last years of leadership in the state senate are marred by an ethical lapse. After a sexual assault scandal broke in the California capital in the fall of last year, with over two hundred female legislators, lobbyists, and staffers signing a letter describing a culture of misconduct and hostility, activists criticized de León for responding slowly and insufficiently. When I ask him about that, and Sacramento&apos;s #MeToo moment, de León counters that he hired two outside law firms within weeks and set up a a 1-800 hotline. 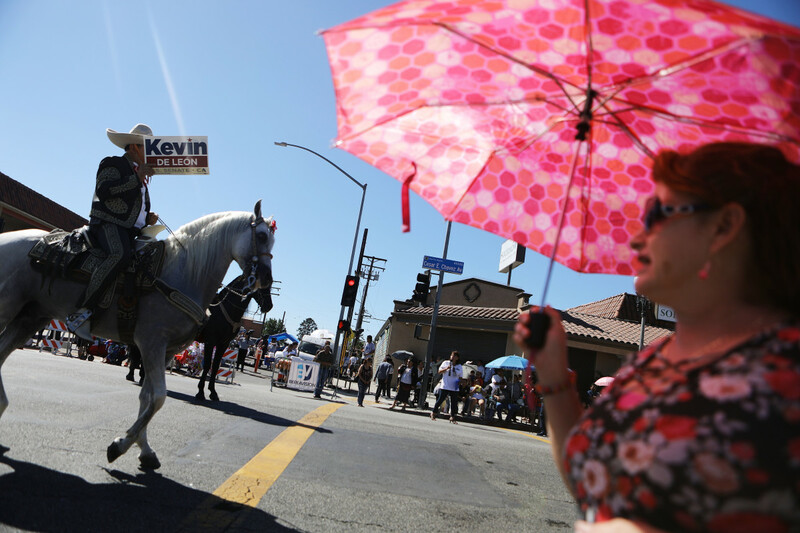 A horseback rider carries a sign in support of Kevin de León during the East L.A. Mexican Independence Day Parade on September 16th, 2018, in Los Angeles, California. "The system is not fixed to my satisfaction," says Christine Pelosi, a Democratic Party activist and daughter of Nancy Pelosi. The younger Pelosi is one of the more prominent signatories of the letter. In the last year, Pelosi has lambasted de León and the rest of the leadership&apos;s response. She explains to me that there have been no confidential counseling services provided, and that the outside law firms hired do not have subpoena power. She also notes that confidence in the hotline&apos;s confidentiality and efficacy remains low enough that many women in the capital are still calling her instead. Beyond that, if de León is going to accuse his opponent of contributing to a broken culture in Washington, it seems he ought to take responsibility for a hostile culture that existed in his own capital under his watch. "It&apos;s not just Kevin," Pelosi says, explaining she places the blame on the leadership in its entirety. "But if you&apos;re going to campaign on support for [women and women&apos;s] issues, I think we have to be very careful." Though Pelosi has not held back in her criticism of de León, and is currently supporting Feinstein, she still has a strong positive reaction to de León&apos;s platform. "He is so deep on climate, and he is so deep on immigration, and I think that&apos;s made Feinstein go deeper on those issues," she says. "That&apos;s a good thing for the state regardless of who wins." That "deep" commitment to issues like climate and immigration is noted by observers even outside of the state. "He is a man of principle, but he&apos;s also very effective. Even with his belief, he wants to get things done. It&apos;s a mixture of pragmatism and principle," says Mickey Edwards, the former Republican congressman from Oklahoma. In a turn of irony that does not escape either of them, Edwards, who authored the amendment preserving U.S. financial support for the Contras in the war in Nicaragua, has been one of de León&apos;s political mentors for almost a decade. The two met in 2009, when de León was chosen for the prestigious Rodell Fellowship for promising public officials, a program Edwards runs out of the Aspen Institute. Edwards remembers getting to know de León during a long walk through New Orleans (they talked about Nicaragua, but they say it stayed amicable). A conservative&apos;s conservative, and one of the founding trustees of the Heritage Foundation, a prominent right-wing public policy think tank, Edwards says he&apos;s always been impressed with de Leon&apos;s principled nature, even as the two disagree on a variety of fundamental issues. "He&apos;s not one of these guys—and I&apos;ll refer nastily to some guys in my Republican Party, where guys seem to be all the time selling out their principles for whatever reason, to get re-elected, or to be loyal to their party—Kevin is not ever going to do that. He&apos;s just not. He&apos;s going to do what he thinks is the principled thing." The biggest grail of de León&apos;s time in the state senate was SB-100, the bill committing California to 100 percent renewable energy by 2045. By itself, California is the world&apos;s fifth largest economy (right above Britain). 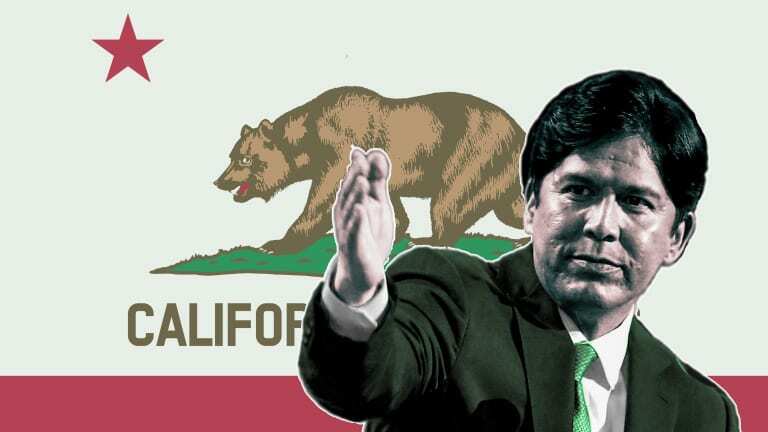 Because of the state&apos;s massive size and output, the bill de León authored has been called the most ambitious climate target in history. California is now set to lead the globe in addressing climate change. However, when SB-100 passed earlier this year, de León&apos;s name was absent from the news stories. The way journalists write headlines put most of the attention on California Governor Jerry Brown as he signed the monumental bill at California&apos;s high-profile climate conference in September. What the headlines missed was the fact that Brown&apos;s signature was almost begrudging; he had invested little political capital in the bill, SB-100. He had not entered the push to get it passed. De León tries to remain diplomatic, but I can sense his frustration. He tells me how Brown did little to further the bill, but did plenty to sweep up the credit. Many in the leadership in Sacramento say de León is not exaggerating. When the bill faltered in the state&apos;s assembly, Brown did not enter the fray. Instead, de León swept in to get the votes. He worked across the aisle: The final bill counts multiple Republicans as co-authors. 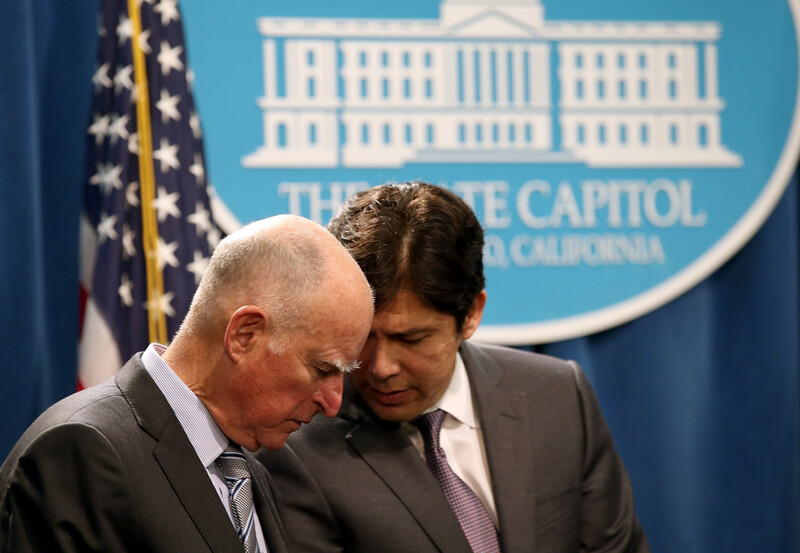 Jerry Brown and Kevin de León share notes during a news conference on March 19th, 2015, in Sacramento, California. Even in a state as blue as California, legislation like SB-100 has not been easy to pass: It was Democrats in the state&apos;s oil rich Central Valley who proved some of the more skeptical lawmakers. De León sat down with them. It&apos;s hard to figure out what happened behind closed doors, but there&apos;s hints that he had to rely on more than his well-known charm. "He has this ability to bring people on board," says Lorena Gonzalez-Fletcher, an assemblymember representing the state&apos;s 80th District, which includes de León&apos;s old hometown. "He&apos;s an organizer by training. And he knows how to organize people and make them feel like they want to be part of the team. And you always want to be part of the team." But de León&apos;s legislative success comes at a cost. His ambition in pushing a huge progressive package has rubbed many in the the capital wrong way. The most consistent criticism I heard of de León is that he has an ego; that he chases headlines. Few de León critics I reached out to agreed to speak with me on the record, but the most consistent criticism was that de León is in this more for his own name than for the issues. This, detractors say, is why de León is running an unwinnable race against Feinstein. He let his ego get the best of him, and now, after a likely unsuccessful shot at Washington (and a state senate career that will hit a term limit this year), he&apos;s facing what could be the end, or at least a major stall, in his political career. If he had been smarter, he would&apos;ve run for lieutenant governor—an easier, but less consequential race he could have easily won. It would&apos;ve set him up for a shot at governor in 2022. I ask de León about the claims that he&apos;s fallen victim to hubris. His voice remains characteristically calm, but there&apos;s the slightest hint of an edge as he answers: "I don&apos;t chase headlines. I make news." Finally, after two-plus hours in the car, we arrive at our destination: an auditorium in a strip mall in Vista (a town just north of San Diego). The building is modest, a place that&apos;s usually reserved for quinceañeras. As de León walks up to the campaign event, a man, beaming as if he&apos;s meeting the president, greets him at the door. The room has white drapes set over the ceiling, which look nice, even though the hall is essentially a large rectangle filled with circular tables. "Bienvenidos!" the man says. "Welcome to Vista"—pronouncing it Vis-ta, the Anglo pronunciation—"or, as we call it Vista"—this time he pronounces it Vee-sta, the original Spanish pronunciation. De León grins and shakes the man&apos;s hand quickly before walking into the hall; he&apos;s running late. Inside, there&apos;s a candidate for city council giving a speech in Spanish, but everyone in the room turns to look at de León. There are excited whispers, many of them coming in Mexican and Salvadoran accents. If elected to the Senate, De León would be the first Latinx to serve as the U.S. senator for California, here in a state that used to be Mexico; in a state were Latinxs outnumber white people and all other racial groups. The candidate at the front ends her speech, and, as she finishes, one of the women running the event hurries up to the mic. 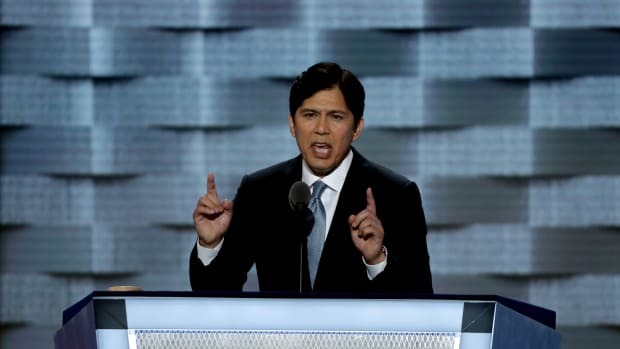 "Please join me in welcoming Kevin de León, candidate for the senate of the United States!" she says in Spanish. Applause breaks out, and the room again turns to de León, who is, in a moment of misfortune, now waiting at the door for the auditorium&apos;s one bathroom, over in a corner of the room. Somehow, de León manages to react in a way that dissolves any awkwardness. He grins and waves at the audience. The event continues in Spanish, with candidates coming up to speak with either bilingual abilities or a translator. Around de León, a steady crowd starts to form, waiting to take photos. There are hushed and excited whispers in Spanglish, the language of de León&apos;s campaign. Finally, de León delivers his speech. It&apos;s the same one I&apos;ve heard before: The story of his mother leaving Guatemala to come to the U.S., the repeated remarks about her "audacity" and her "courage." But there was a difference: He delivers the speech in Spanish. "Siempre digo, mi historia no es única," he says with his bilingual fluency and frontizero (read: borderlands) accent. Here, he takes a turn I didn&apos;t expect: After affirming he&apos;ll protect the "human dignity" of the people in the room, and all of his gente in California, he starts talking about the need to address climate change. It&apos;s the first time I&apos;ve heard a speech about climate change in Spanish, but it makes sense: In our first meeting, de León says addressing climate change is also about race, and poverty. He says we need to ask which communities are being most affected by a warming planet, and which communities are reaping in the benefits of new green technology. In the car after the speech, he tells me about his dream, "To make Latinos the face of the fight against climate change." The speech ends, with de León again talking about his mother, the beauty of migration and parental sacrifice, the need to see ourselves represented in public office. I look to the woman next to me, gripping a "De León for Senate" sign against her chest with her forearms. Her hands are folded together underneath her chin. She&apos;s crying. On the drive back from the event, on Highway Five between Los Angeles and San Diego, de León points suddenly out the window. "Look at that," he says. It&apos;s small billboard on the side that reads, "YOUR TAX DOLLARS AT WORK REBUILDING CALIFORNIA" over an icon that read "SB 1." 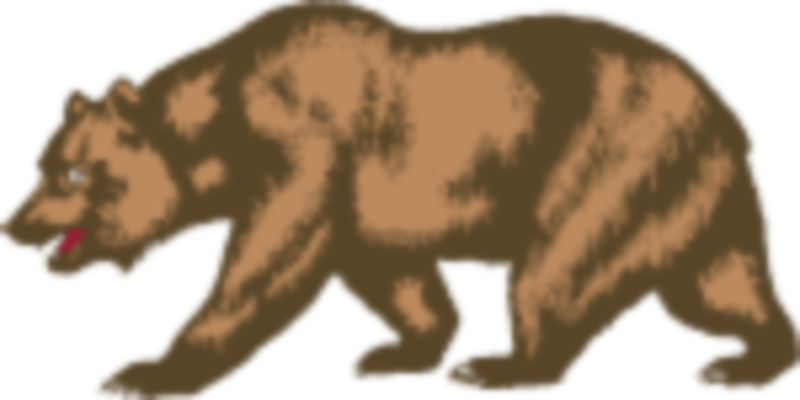 "SB 1. I negotiated that," he says. He launches into a description of the intricacies of the bill, and the different ways it will help Californians. The bill raises a tax on gas to fund billions of dollars in infrastructure projects. Besides making bridges and highways safer, de León says filled-in potholes will save drivers millions in suspension repairs. This isn&apos;t a speech I&apos;ve heard before, and it&apos;s really more of an aside—as senate president, he worked hard to get it on the floor, but he&apos;s not author on this bill, and it&apos;s not his baby the way the clean energy bill is. But he sounds as passionate as he does in his speeches. When we finally get to de León&apos;s house (way up in the hills of L.A.&apos;s Mount Washington neighborhood), de León starts to get out of the door, but then turns around to me. He asks the question politicians always want to know of the reporter profiling them. "Who else are you talking to for this story?" The car dings. I mention that I&apos;ve talked to his old friend Nuñez, and I begin to list some state senators and assemblymembers I&apos;ve spoken with. "Here," he says. "Do you have WhatsApp?" He pulls out his phone, and begins listing off names and numbers, sometimes emails, sometimes saying: "Ah. Probably shouldn&apos;t give you their number, but I&apos;ll ask if they want to talk to you." It&apos;s not the first time he&apos;s done this, and, by the end of our talks, the full list of people he&apos;s name-dropped include a former U.S. attorney general and a secretary of state; a United Nations undersecretary for climate change; a renowned architect; an Argentine rock star; a former congressman; the prime minister of Spain. "It&apos;s very unusual," Edwards says, laughing when I ask him if it&apos;s unusual for a state senator to carry so many international connections. "A lot of the people in my program—and I have great respect for all of them—don&apos;t think that way. Kevin is not trying to, quote, &apos;Be a state senator,&apos; or, quote, &apos;Be a U.S. senator.&apos; What he is trying to do is to make things change.... He will look at things holistically. He would be among the last people in the world to tell himself, &apos;I need to stay in my lane." Edwards is, coincidentally, the last name de León lists in the dark of Mount Washington, still sitting with the Mazda door half-open; he gives me the former congressman&apos;s landline. When he finally gets out of the car and closes the door, it&apos;s sometime close to 1 a.m. The next afternoon, I&apos;m talking on the phone with Wendy Carrillo, a California assemblymember from L.A. She says she got a text from de León at 5:30 a.m. that same morning. He had an idea for legislation she ought to introduce; they needed to talk soon.